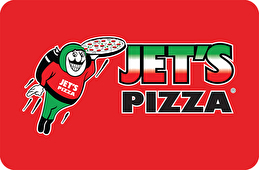 Jet's® is about better pizza. That's why we use the highest quality ingredients from dough made fresh daily, fresh cut toppings such as onions and green peppers, premium mozzarella cheese, and sauce made from scratch from the best tomatoes available. We have never skimped on the product or the ingredients and never will. As soon as you taste a fresh, hot slice of our pizza you will notice the difference…it's better than the rest. Jet's Pizza® has grown to over 390 stores in 20 states and we continue to commit to quality at each location. While quality and taste is number one, we also strive to make our customers happy with every order we make. So if you're hungry for pizza say "Life is Short. Eat Better Pizza®. Let's Get Jet's®"
*Gift cards not redeemable online. 6813 N. Green Bay Rd. 2045 Gulf to Bay Blvd. 1300 E. Oakland Park Blvd. Select a dollar value for the physical gift card. For balance inquiries call the phone number to a Jet's Pizza®'s location below.